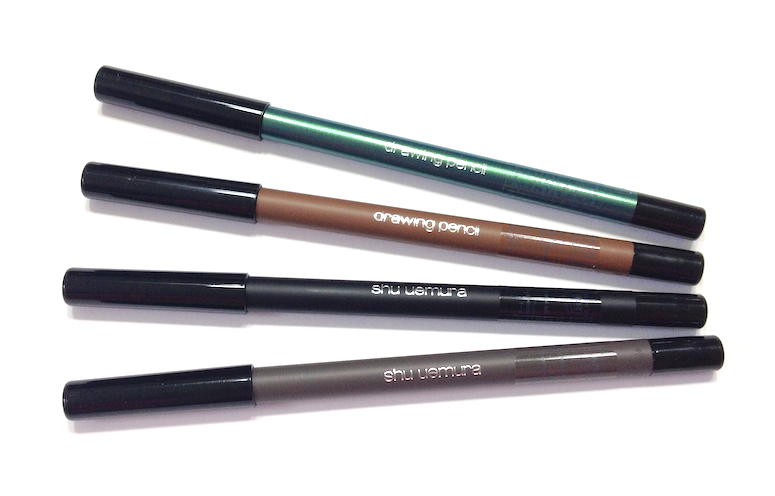 Shu Uemura recently revamped their eyeliners 9 dubbed Drawing Pencils - and introduced four new eyeshadow palettes, each featuring a monochromatic colour scheme. Although I love a good plummy eye, I can't say I'm usually drawn to a full-on pink look. With my olive-leaning skin and brown eyes, it can look like I've lost ten rounds with my pillow. 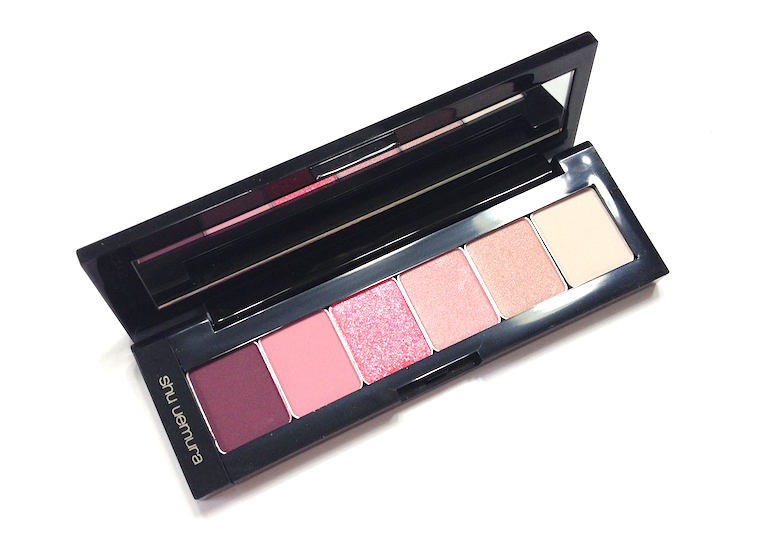 The Ready To Wear Palette in Pink Hues palette was just so PRETTY though, that I put my hesitation aside and committed to trying it out in a variety of permutations. Overall, I was really pleased by the performance of the shadows in this palette. The matte grape wasn't impressive upon swatching, with a firm, smooth and slightly dry texture that appeared a little sheer and patchy when dabbed on the arm. However, when it was applied with a brush to the eyelid, the pigment transferred without an issue. This is not the kind of colour that goes on with full-blast intensity right away, but with a dark shade like this, I can't say that's a bad thing. It was easy enough to build up to greater depth, and it blended well. 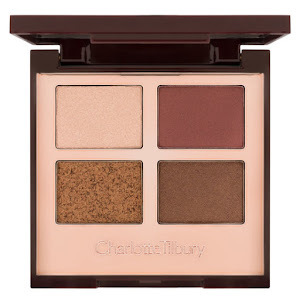 It's perfect for adding deepness to the outer corner, or building up a hazy smoky eye. The soft matte pink had a softer texture than the grape, swatched more opaquely and applied to the lid smoothly. It's definitely a shade I need to use sparingly with my colouring, but I have no complaints about texture or performance. I actually don't have this kind of colour in my collection, so once I got over that bit of shock, I was happy to have it in potential rotation. The "wet" sparkle of the third pink from the left makes it a fantastic layering shade. The hot pink base is quite sheer, so what you get is this glistening effect that looks incredibly when dabbed to the centre of the eyelid. Applied like that over the grape (heavily built up into a smoky eye) looks intense and totally unexpected. The pale pink and pale peachy-pink shimmers are smooth, creamy and dense, with intense pigmentation. They apply beautifully, but look virtually indistinguishable from each other once on, so I do wish there had been some greater variation. That said, they are both completely lovely. The matte beige has a similar texture to the matte pink, and is that rare near-white colour that doesn't look chalky. Perfect brow bone highlight, especially if you're going with an otherwise shimmer/sparkle heavy look. For 85$ CAD, I do think this is a pricy little set, especially considering the monochromatic theme. It's definitely not a palette that stands by itself, though the quality of each shadow ranges from good to great, so there is no doubt they would each get their use in combination with other products. And the Drawing Pencils. These are meant to be blend able and waterproof, with 21 different shades to choose from, and 4 different textures. The M Black 01 and M Grey 05 are probably the best performing of the four. 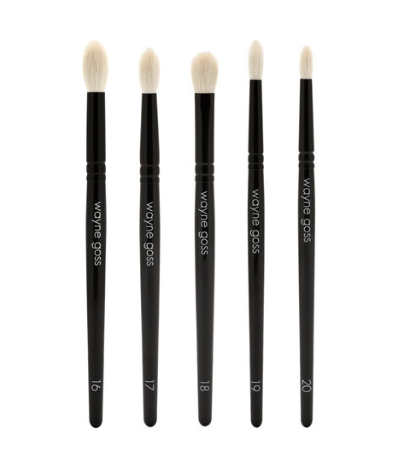 They apply smoothly, with very rich pigmentation and a creamy texture. The M Earthy Brown 82 actually has to be built up a bit as the first layer is sheer, and rather than feeling creamy it's more oily/waxy. I have to say, the colour reads a little off to me as well, and looks a little dirty around my eye. It's my least favourite of the four, both in terms of texture and actual colour. The ME Green 51 is GORGEOUS. 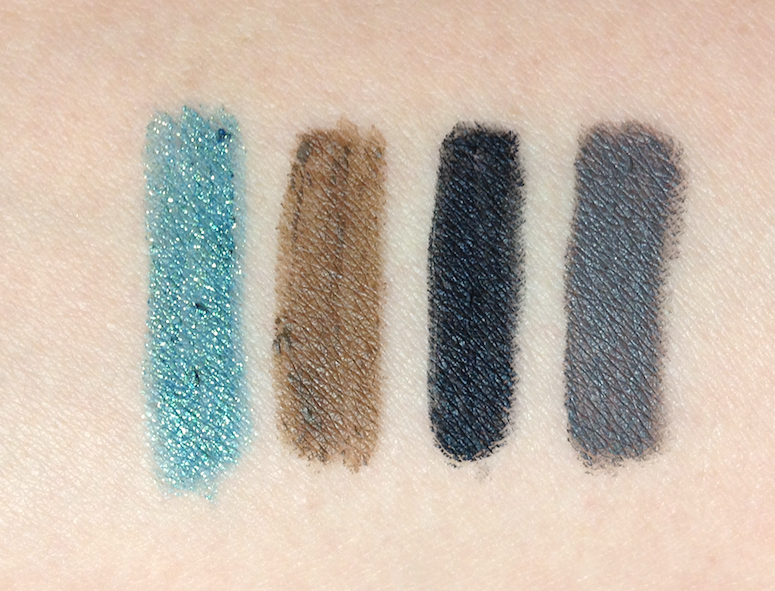 A perfect teal with incredible golden sparkle, it's also sheerer at first swipe. 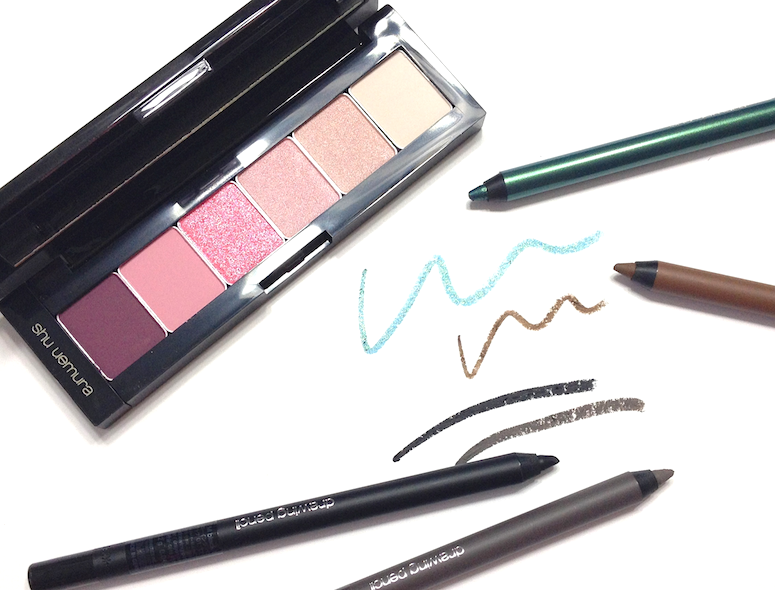 These had more of a learning curve than I'm used when it comes to eyeliners. With the shades that required a second swipe for full opacity, I found that I needed to let them dry, or the product wound up coming up with that second pass. It was a little frustrating until I figured that out. Fortunately, they dry down incredibly fast, so waiting to do a second layer wasn't a hardship. Un-fortunately though, that über-quick dry down time means that you have to work incredibly fast if you want to smudge these. Even at that, I don't think they blend out all that well, as they just wind up looking a little patchy and washed out more than anything. As the name suggest, I do think these are best suited for creating strongly graphic lines, which they do very, very well. Because of their intense creaminess, they're also best when sharpened to a good point, and applied almost laid down on their side, with the length of the exposed "lead" along the lash line. They tended to skip or crumble along the lash line for me when applied in the usual, point-first manner. I can attest to the waterproof claim, but I can't say that they're epically long-wearing, as I got fading and a bit of crumbing/cracking in the line after 6 or so hours. They contain a combination of a rigid and flexible silicon polymer, which together are supposed to provide good adhesion and flexibility. On my eyes, I suspect the rigid ingredient just doesn't hold up, either because of the natural oils on my lid or that way my eye moves/is shaped. 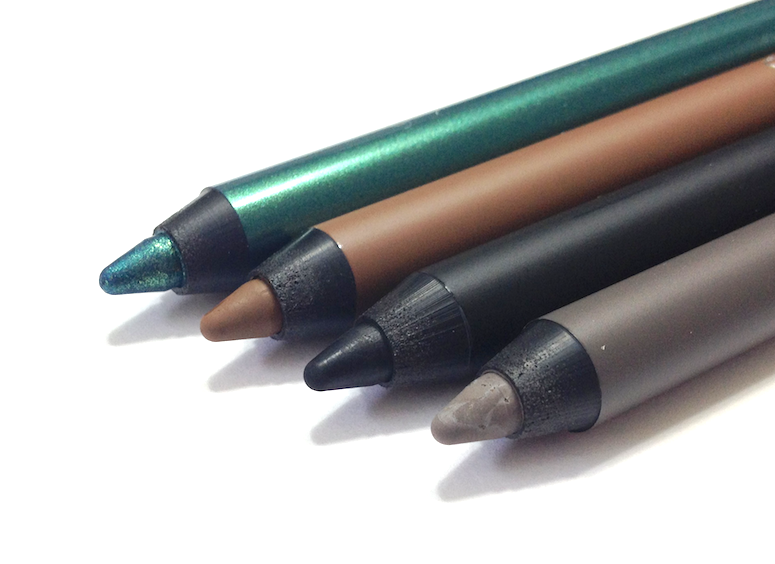 I suspect that if you have problems with eyeliner wearing off, you'll either love or hate the Drawing Pencils, depending on how your personal skin chemistry reacts with the polymers and other waterproofing ingredients. While I do love the colour range, the waterproofness and the intensity that can be achieved, they are spendy, especially considering the potential application issues. Have you guys tried any of the newness from Shu? I get the feeling that it's a very cult-y kind of brand. I know a lot of MUAs who adore it, but I tend to get a lot of blank looks when I chat with the average makeup lover about them. 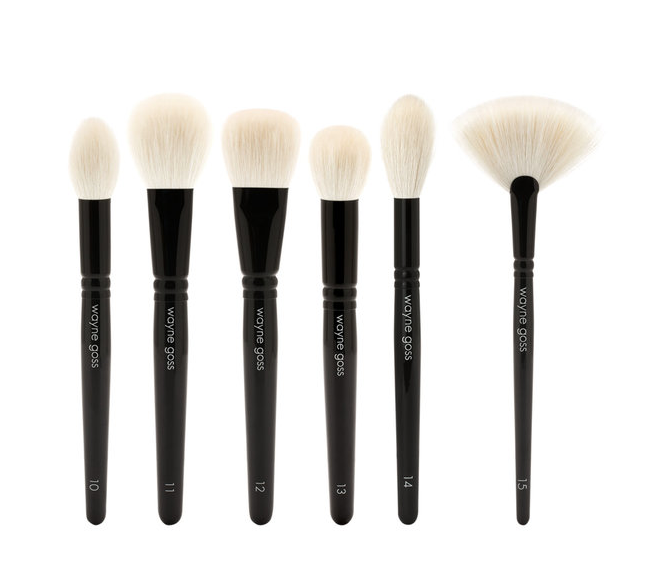 Availability: At certain Holt Renfrew and Sephora locations, as well as online at www.shuuemura.ca. 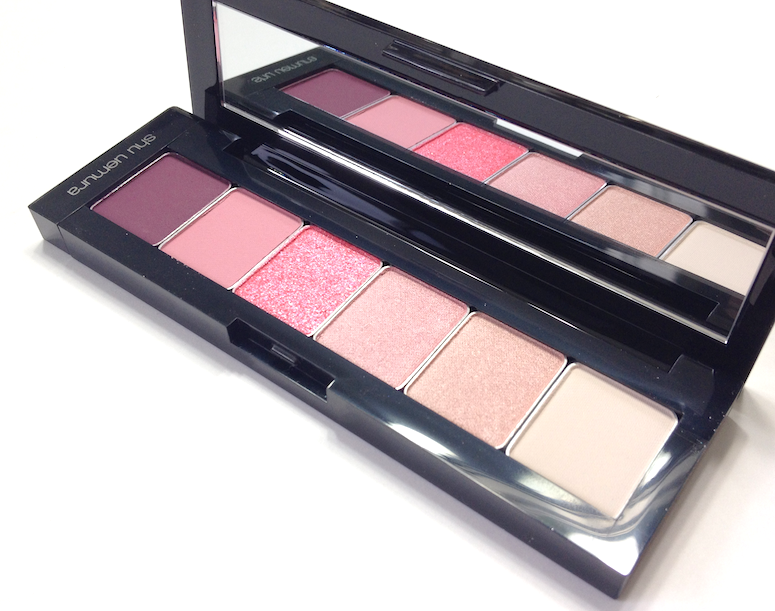 Price is 85$ CAD (65$ USD) for the Ready To Wear palettes, and 28$ CAD (25$ USD) for the Drawing Pencils.